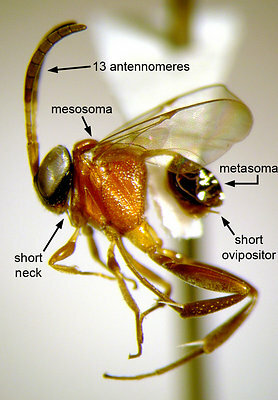 Wasps in the family Evaniidae have uniquely shaped metasomas with tubular petioles and shortened, laterally compressed metasomal segments 2-8 (Fig. 1). When alive these wasps often pump their metasomas up and down, earning them the common name of ensign or hatchet wasps. Because females oviposit into cockroach egg cases (oothecae) these wasps are commonly found in houses and other buildings. They can also be seen drinking nectar on flowers or searching through leaf litter for egg cases of native cockroaches. Currently the family is divided into 31 genera, 11 of which are represented only in the fossil record, and 455 species (20 of which are fossils) (Deans 2005). Fig. 1 Lateral habitus of Semaeomyia sp. showing the uniquely shaped metasoma, 13-segmented antenna, short and stocky body, and short, thin ovipositor. Fig. 2 Evania albofacialis fore and hindwings. JL = jugal lobes, CV = reduction or loss of crossveins, M,CU = hind wing vein. Fig. 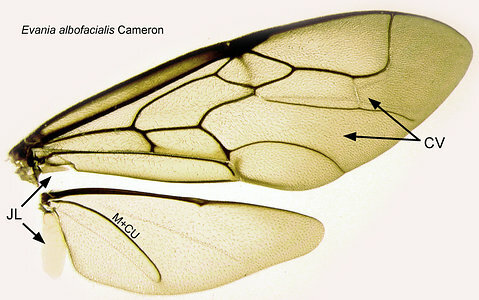 3 Evaniid fore wings showing the extreme variation in venation between genera. L to R: Evaniella, Vernevania, Zeuxevania, Evaniscus, Trissevania, Brachygaster, Semaeomyia, Decevania, and Hyptia fore and hindwings. The life history is also considered to be a synapomorphy for the family. All published rearings indicate that these wasps develop as solitary egg predators within cockroach oothecae (Dictyoptera: Blattaria). Most of our knowledge about evaniid development comes from research on two cosmopolitan species, Evania appendigaster L. and Prosevania fuscipes (Illiger), which specialize on the oothecae of pestiferous Periplaneta and Blatta cockroach species (Blattidae: Blattinae). There have also been some studies on evaniids native to Europe (Brachygaster minutus (Olivier) by Brown 1973; Zeuxevania splendidula (Costa) by Genieys 1922) and North America (Hyptia spp. by Edmunds 1954, 1952a). A female ensign wasp will typically oviposit a single egg inside an ootheca. That egg will either be inserted into a cockroach egg (Brown 1973) or between the eggs (Edmunds 1952b), depending on the species. Behavioral studies suggest that some evaniids are capable of ovipositing into oothecae carried by the female cockroach (Roth 1989), and that others will not approach the ootheca until it has been deposited (Edmunds 1952b). Records also indicate that evaniid larvae develop solitarily (i.e., one larvae per ootheca; Edmunds 1953), and that species are apparantly somewhat specialized on certain host species (Deans et al. 2006; Deans 2005). However, some researchers speculate that evaniids might actually specialize on oothecae of a certain size rather than a particular taxon (Deyrup and Atkinson 1993). With hosts known for less than 4% of all described evaniid species, however, there are bound to be exceptional or otherwise unusual biologies. 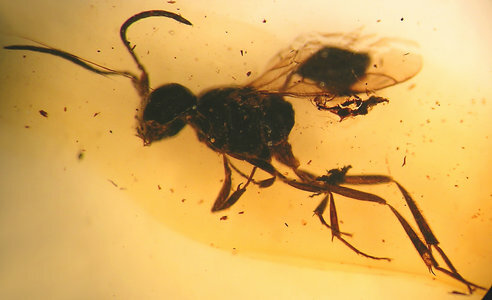 Evaniids are relatively well represented in the fossil record, with species found in amber resins from the Late Cretaceous (see Fig. 4; Deans et al. 2004, Basibuyuk et al. 2002, Basibuyuk et al. 2000a, 2000b), Upper Eocene (Sawoniewicz & Kupryjanowicz, 2003, Nel et al. 2002a, Brues 1933), and Miocene (Nel et al. 2002b), as well as compression fossils from the Upper Jurassic (Zhang and Zhang, 2000), Lower Cretaceous (Rasnitsyn, 1991), and Upper Cretaceous (Rasnitsyn & Brothers 2006, Rasnitsyn 1975). These fossils suggest that the family emerged nearly 150 million years ago and has changed little since. Fig. 4 Protoparevania lourothi Deans. From ~125 million year old Lebanese amber (Hauterivian). Until the early 1900s Evaniidae remained a "dumping ground" (Bradley 1908) for wasps with unusual morphological configurations, and the family was allied with or included such diverse lineages as: Aulacidae, Gasteruptiidae, Ichneumonoidea, Stephanidae, Monomachidae, Braconidae: Cenocoeliinae, Pelecinidae, Trigonalyidae, Megalyridae, and Roproniidae (Kieffer 1912, Bradley 1908). Hedicke (1939) defined the family to exclude these other lineages, and Basibuyuk et al. (2002) fine-tuned the definition of Evaniidae using characters from the extensive fossil record. Basibuyuk et al. synonymized the fossil family Cretevaniidae with Evaniidae, but their analyses could not resolve the placement of Andreneliidae (represented in the tree above as Andrenelia). Zeuxevania and Parevania should probably just be Zeuxevania - these genera are only separated based on the presence/absence of a single crossvein (fore wing 1RS). Szepligetella, Evaniella, and Acanthinevania may all be the same genus. Szepligetella and Acanthinevania are both Australasian, whereas Evaniella is exclusively neotropical (except one species can be found in the USA). They have exactly the same wing venation. More host rearing records and phylogenetic data are required to understand the emerging pattern of host use, which seems to indicate that ensign wasps are "host" specific. Basibuyuk, H. H., M. G. Fitton, A. P. Rasnitsyn, and D. L. J. Quicke. 2000a. Two new genera of the Evaniidae (Insecta: Hymenoptera) from Late Cretaceous New Jersey amber. Pp. 313-325 in: Grimaldi, D. (ed. ), Studies on Fossils in Amber with Particular Reference to the Cretaceous of New Jersey, Backhuys Publishers, The Netherlands. 504 pp. Basibuyuk, H. H., A. R. Rasnitsyn, M. G. Fitton, and D. L. J. Quicke. 2000b. An archaic new genus of Evaniidae (Insecta: Hymenoptera) and implications for the biology of ancestral evanioids. Bulletin of The Natural History Museum of London (Geology) 56: 53-58. Basibuyuk, H. H., A. R. Rasnitsyn, M. G. Fitton, and D. L. J. Quicke. 2002. The limits of the family Evaniidae (Insecta: Hymenoptera) and a new genus from Lebanese amber. Insect Systematics and Evolution 33: 23-34. Brown, V. K. 1973. The biology and development of Brachygaster minutus Olivier (Hymenoptera: Evaniidae) a parasite of the oothecae of Ectobius spp. (Dictyoptera: Blattidae). Journal of Natural History 7: 665-674. Brues, C. T. 1933b. The parasitic Hymenoptera of the Baltic amber. Part I. Bernstein-Forschungen (Amber Studies) 3: 4-178. Deans, A. R. 2005. 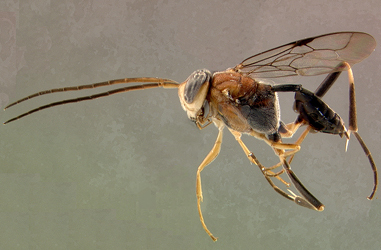 Annotated catalog of the world's ensign wasp species (Hymenoptera: Evaniidae). Contributions of the American Entomological Institute 34 (1): 1-164. Deans, A. R., J. J. Gillespie, and M. J. Yoder. 2006. An evaluation of ensign wasp classification (Hymenoptera: Evaniidae) based on molecular data and insights from ribosomal RNA secondary structure. Systematic Entomology 31 (3): 517-528. Deans, A. R. and M. Huben. 2003. Annotated key to the ensign wasp (Hymenoptera: Evaniidae) genera of the world, with descriptions of three new genera. Proceedings of the Entomological Society of Washington 105 (4): 859-875. Deans, A. R. and R. Kawada. 2008. Alobevania, a new genus of neotropical ensign wasps (Hymenoptera: Evaniidae), with three new species: integrating taxonomy with the World Wide Web. Zootaxa 1787: 28-44. Deyrup, M. and T. H. Atkinson. 1993. Survey of evaniid wasps (Hymenoptera: Evaniidae) and their cockroach hosts (Blattodea) in a natural Florida habitat. Florida Entomologist 76: 589-593. Edmunds, L. R. 1952a. Some Notes on the Habits and Parasites of Native Wood-roaches in Ohio (Orthoptera: Blattidae). Entomological News 63 (6): 141-145. Edmunds, L. R. 1952b. The oviposition of Prosevania punctata (Brullé): a hymenopterous parasite of cockroach egg capsules. Ohio Journal of Science 52 (1): 29-30. Edmunds, L. R. 1953. Collecting and culturing of native wood-roaches in Ohio, with some additional notes on their biology. Entomological News 64: 225-230. Edmunds, L. R. 1954. A study of the biology and life history of Prosevania punctata (Brullé) with notes on additional species (Hymenoptera). Annals of the American Entomological Society 47 (4): 575-592. Genieys, P. 1924. Contribition a l’étude des Evaniidae, Zeuxevania splendidula Costa. Bulletin Biologique Société de France et Belgique 58: 482-494. Hedicke, H. 1939. Evaniidae. In: Hymenoptorum Catalogus. H. Hedicke (ed.) Pars 9. Dr. W. Junk. ‘s-Gravenhage. 50 pp. Kieffer, J. J. 1912. Hymenoptera, Ichneumonidae, Evaniidae. Das Tierreich 30: I-XIX + 1-431. Berlin. Nel, A., A. Waller, G. Hodebert, and G. De Ploëg. 2002a. An ensign-fly in the lowermost Eocene amber from the Paris basin (Hymenoptera: Evaniidae). Annales de la Société Entomologique de France (N.S.) 38: 263-269. Nel, A., X. Martínez-Delclòs, and D. Azar. 2002b. A new ensign-fly from the Lower-Middle Miocene Dominican amber (Hymenoptera, Evaniidae). Bulletin de la Société entomologique de France 107 (3): 217-221. Rasnitsyn, A. P. 1975. Hymenoptera Apocrita of Mesozoic. Trudy Paleontologicheskogo Instituta Academii Nauk SSSR (Academy of Sciences of the USSR Transactions of the Palaeontological Institute) 147: 1-134 + plates I-VIII. Rasnitsyn, A. P. 1991. Early Cretaceous evaniomorphous hymenopteran familes Stigmaphronidae and Cretevaniidae and the subfamily Kotujellitinae (Gasteruptiidae). Paleontologicheskiy Zhurnal 4: 128-132. Rasnitsyn, A. P. and D. J. Brothers. 2006. Extending ancestry: two new hymenopteran fossils from the mid-Cretaceous of southern Africa (Hymenoptera: Jurapriidae, Evaniidae). African Invertebrates 48(1): 193-202. Roth, L. M. 1989. Sliferia, a new ovoviviparous cockroach genus (Blattellidae) and the evolution of ovoviviparity in Blatteria (Dictyoptera). Proceedings of the Entomological Society of Washington 91 (3): 441-451. Sawoniewicz, J. and J. Kupryjanowicz. 2003. Evaniella eocenica sp. nov. from the Baltic amber (Hymenoptera: Evaniidae). Acta Zoologica Cracoviensia 46 (suppl.- Fossil Insects): 267-270. Zhang, H. and J.-F. Zhang. 2000. A new genus and two new species of Hymenoptera (Insecta) from the Upper Jurassic Yixian formation of Beipiao, Western Liaoning. Acta Micropalaeontologica Sinica 17: 286-290 + plate I. Page: Tree of Life Evaniidae. Ensign Wasps. Authored by Andrew R. Deans. The TEXT of this page is licensed under the Creative Commons Attribution-NonCommercial-ShareAlike License - Version 3.0. Note that images and other media featured on this page are each governed by their own license, and they may or may not be available for reuse. Click on an image or a media link to access the media data window, which provides the relevant licensing information. For the general terms and conditions of ToL material reuse and redistribution, please see the Tree of Life Copyright Policies.